Enko-football: The stadium in the Brazilian jungle after the world cup becomes a prison? The stadium in the Brazilian jungle after the world cup becomes a prison? Brazil will next year host the World Cup in football, and matches will be played at 12 stadiums across the country. 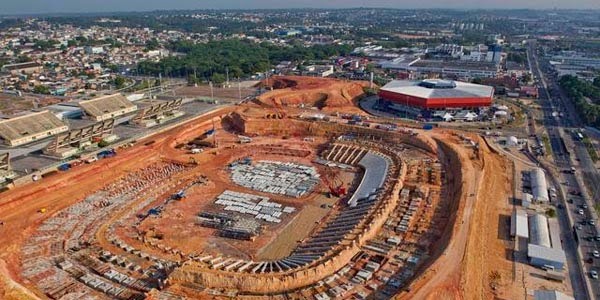 Most problematic is the newly built stadium "Arena Amazonia" in Manaus, in the jungle and the wilderness of the Brazilian state of Amazonas. The stadium is so after the World Cup will not be used for sporting purposes, and is thus one of judges came up with the idea that the stadium be correctional institution. During the Confederations Cup, held in Brazil, the World and Brazilian FOOTBALL FEDERATION officials were targeted by demonstrations in the South American country. Millions of impoverished Brazilian protesters were then took to the streets across the country, and expressed dissatisfaction with the big spending money on sport, and poor public services, high taxes and extreme social inequality.